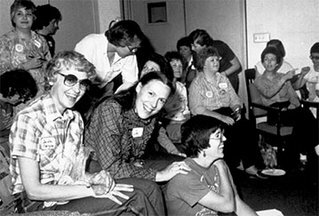 The National Organization for Women’s Equal Rights Amendment (ERA) Committee invites you to join them for a virtual watch party of We’ll Meet Again with Ann Curry’s episode on the women’s movement TODAY, January 8, 2019, at 8/7c on PBS. The episode will feature an in-depth exploration of Pacific Shore NOW President Zoe Nicholson’s hunger strike for the ERA in Illinois. It’s been 47 years since the United States Senate passed the Equal Rights Amendment and sent it to the states for ratification. During this time, the National Organization for Women (NOW) has been a leader in the ratification effort and thousands of NOW activists across the country lined up and took action in their state houses, demanding that their legislators ratify the amendment. However, while many states passed the measure, one state would soon become ground zero for the war on equal rights. Illinois was primed to become one of the final states to ratify. In May 1982, NOW activist and Pacific Shore NOW President Zoe Nicholson, a lifelong activist and one of the country’s leading scholars on Alice Paul, joined Sonia Johnson, a leading figure in the ERA campaign who was excommunicated from the Church of Latter-day Saints for her views on women’s rights, and five other women in Illinois, to take part in a 37-day hunger fast, in a campaign for women to be part of the U.S. Constitution through the Equal Rights Amendment (ERA). Sadly, the state legislature did not agree and today, 47 years later, we are now only one state away from ratifying the ERA. This episode features Zoe’s story and her willingness to die for equal rights. Help us spread the word to your communities, chapters, friends, and families about why we need the #ERANOW! Follow along with updates from our ERA Committee in the coming months as they provide action items, for NOW, members to participate in from their home state to help ratify the ERA in Virginia, North Carolina, Florida, or Arizona. We need YOU to help us get out the word about the critical importance of equality between the sexes. Watch with us as we continue the conversation about the #ERANOW and use the following hashtags to drive the conversation. Give a shout out to @NationalNOW when your viewing begins!